Thanos makes his arrival in Avengers: Infinity War. It turns out the giant planet we’ve seen Thanos and Iron Man duking it out on in the Infinity War trailer isn’t quite what we thought it was. 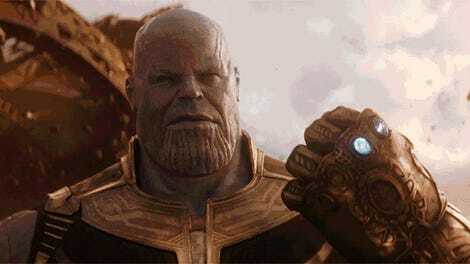 Entertainment Weekly’s bevy of coverage about the movie this week gave us a glimpse at a moment from this lavish fight that we’ve only seen described to us, as part of closed-door airings of Infinity War footage at D23 and San Diego Comic-Con: a shot of Thanos using the might of the Infinity Gauntlet to literally fling a moon at Earth’s mightiest heroes. That’s no moon... oh wait, no, sorry, it totally is. Speculation about the atmosphere of the orange-hued world and the ruins we can see in the background had theories swirling that this location could’ve been a destroyed Xandar, the planetary home of the Nova Corps last seen safeguarding the Power Stone. But according to the report, it’s actually Titan, Thanos’ home. ...or he could just be misspeaking. It happens! Wherever this Titan comes from, it doesn’t rule out our most beloved recent Infinity War theory that Titan could actually be the missing Soul Stone... or at least it doesn’t yet. After all, it’d be the place Thanos least expects it to be! No doubt we’ll learn more of the Mad Titan’s motivations as we get closer to Avengers: Infinity War’s April 27 release date.